This temperature measuring device is a must have whether you have a new or old heat press! 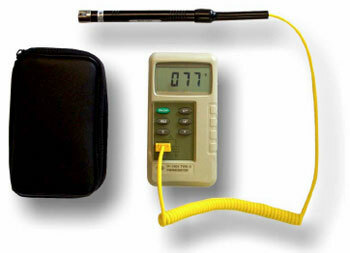 Digital Pyrometer & Surface Probe Kit The Digital Knight Pyrometer & Surface Probe Kit provides the absolute best possible surface temperature sensor available in the world today. Use this device to check your heat press, old or new. This highly accurate Digital Pyrometer (Temperature Sensor) and K-Type surface probe thermocouple provide exact measurements of surface temperature based on contact, NOT based on infrared readings. After many years of frustration over customers getting incorrect temperature readings from IR Laser Gun temperature probes, we decided to make the same surface probes we use available to the public at a greatly reduced cost (normally $200-$300). The IR temp guns do not get accurate readings from Aluminum Platens, due to the completely different Emistivity (radiating) characteristics of aluminum. With non-Teflon® coated aluminum heat platens, an IR Gun reading of 100-150 degrees less than the actual platen temperature is not uncommon. With the surface probe, fast, highly accurate readings of the heat platen surface are immediately available, letting you know just where your heat platen is and what it is doing... Thereby reducing wasted product and time!